It’s one thing to read about history in a book, or see a movie, but it’s quite another to see, feel and walk through the history of a people from their unfiltered point of view. That’s exactly what you get when you visit the Tamástslikt Cultural Institute outside of Pendleton on Interstate 84. Amazing, astonishing, interesting, heartbreaking and hopeful are the range of emotions you will experience if you take the time to read and examine the many different exhibits throughout the permanent exhibit gallery. Whether it’s seeing a traditional tule lodge made of reeds that contract in the summer and expand in the wet winters, or reading the languages of the tribes on all of the different signs around the exhibit, spending a day at the institute will immerse you into the culture of these proud peoples. The permanent exhibit is broken into three parts “We Were,” “We Are,” and “We Will Be.” By far the largest section of the exhibit is the “We Were” section, exploring more than10,000 years of history of the three tribes. 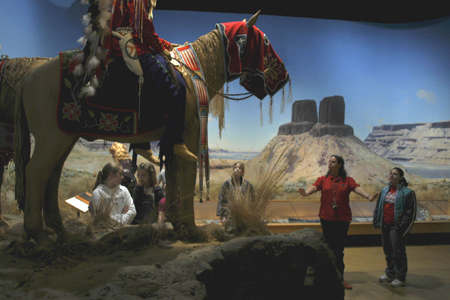 When you are going through the permanent exhibit, you follow the coyote – known in tribal lore as “the trickster” – he is used traditionally to teach children lessons of life, and one of the more amazing exhibits is a reproduction of a teepee where the story of Coyote saving the animal people is projected on the ceiling as a “fire” burns in the center of the room. The institute also has a temporary exhibit space of about 1,700 square feet, which rotates through about four to five exhibits a year. One thing that is amazing about the institute, for all of the history, you are never far from nature. Looking out in the distance you can see the plains and mountains, rock formations and weather coming in – it is a stunning place to visit if not for the view alone. In addition to stunning views and the permanent exhibit, the institute also offers several other amenities for business groups, history buff or the casual visitor. The gift shop has one of the largest selections of Native American art and history books, CDs and movies. From blankets, clothes and crafts, the gift shop focuses on more than 60 local artists and it is reason enough to visit. The 45,000 square foot institute also has small and large meetings rooms and a café, in case your visit takes you over the lunch hour. Tamástslikt celebrates, remembers and teaches the traditions of the Cayuse, Umatilla and Walla Wall Tribes and shouldn’t be missed if you find yourself near the Umatilla Indian Reservation near Pendleton. About the Tamástslikt Cultural Institute: (From www.tamastslikt.org) Immerse yourself in the history, culture and hospitality of the people who have lived on this land for more than 10,000 years. Come to Tamástslikt Cultural Institute and experience the storied past, rich present and bright future of our tribes through interactive exhibits, special events and a Living Culture Village. What to bring: While there are places to stop and rest, most of the museum you will be on your feet, so keep that in mind. . Tip: During the summer months youth and elders alike present many of their traditional cultural practices and lifeways. If you are visiting during the spring or summer months, check the institute’s web site for the schedule and availability. Also make sure to visit the institute’s gift shop as it has local tribal art, books about the history and blankets from and inspired by the local tribes. Season: The center is open year round. Getting there: Plug 72789 Highway 331, Pendleton, Oregon into the GPS and it is pretty easy to find. For those of you who don’t like someone telling you every turn to make, take Interstate 84 to exit 216, the Milton-Freewater, Walla Walla exit, turning onto Oregon 331 and then follow the signs. The institute is near the casino, behind hotel portion of the complex.